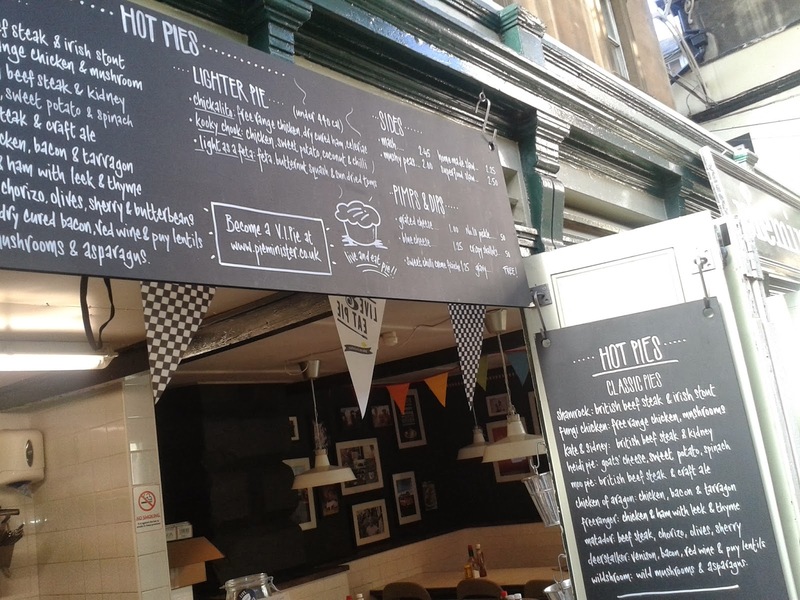 Many of you will have enjoyed a pie from top Bristol pie makers Pieminister before. We've already rated 12 of them! With quality crisp pastry and delicious fillings, the Bristol based pie firm have done us proud many a time. However last summer something odd happened. 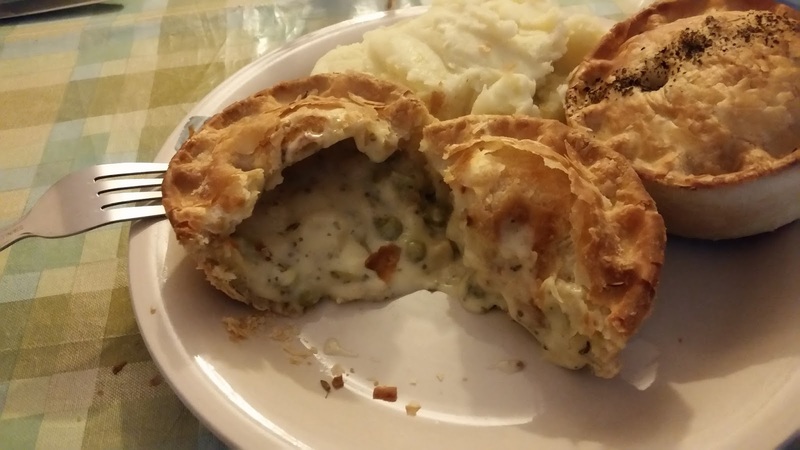 Having produced some of the finest quality pies we've rated on the Seven Cs of pie rating, last summer they inexcusably decided to get rid of the pastry lid to their pies in making a 'lighter' summer range of... well, "pies". Apart from, of course, if you remove the pastry lid, they are no longer pies!!! It bamboozled us so much that we even did some research on the comparison between these 'lighter' "pies" and the normal Pieminister pies, and found that actually the main reason they were less calories was because they were a bit lower in weight and had no pastry lid! But as you know we on the Pierate Ship are pie purists, so the lack of pastry lid hit their 'lighter' pastry products hard on the 7 Cs of pie rating. In fact it left them being some of the lowest scoring pies in our Pieminister leader board, despite the taste being quite good. You just can't ditch a pastry lid in our eyes!!! However, the good news is that Pieminister have seemingly learnt from their error and this summer their two summer pies are fully encased in pastry! Good work Pieminister! 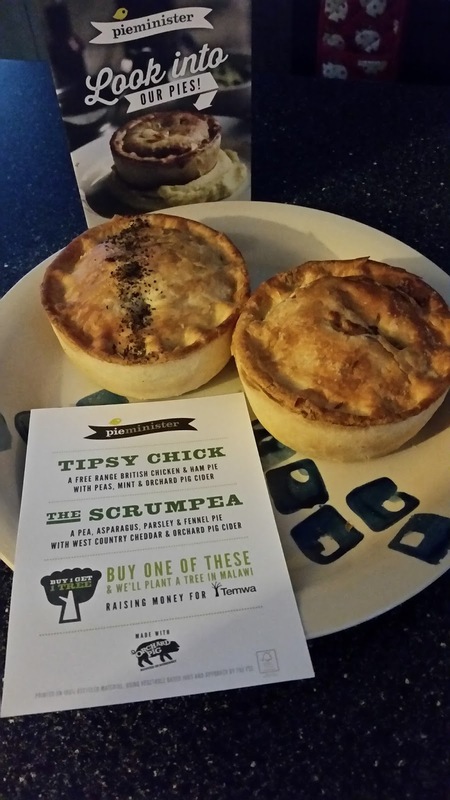 The two pies in their summer range are the Tipsy Chick Pie and the vegetarian Scrumpea Pie, both containing some dry cider to give them a summery but quirky flavour. So with normal pastry service resumed, how would these pies rate? Both pies looked in great condition and at £3.50 for a cold pie from their website it is reasonably priced for a quality British pie made using British meat and quality ingredients. Golden in colour, the pie pastry was nice and crispy on top, really nice and melt in your mouth upon eating. It certainly added a good crunch to the pie experience, and the side and base pastry were lovely and crisp too. The content of the pies was however a bit mixed. The Tipsy Pie - a free range chicken and ham pie with peas, mint and orchard pig cider - was very nice, with a flavoursome but not overpowering content. However it was noticeable that there was sadly just 14% chicken in the pie, which is considerably lower than the 40% meat filling some pies bought at farmers markets can contain. This did leave me feeling I was missing out somewhat on meatilicious content. The content of the Scrumpea pie - a pea, asparagus, parsley and fennel pie with west country cheddar and orchard pig cider - was also very good in general but let down by some overly solid fennel (or some other vegetable). It was hard to ignore, as unfortunately the vegetable was so solid that I couldn't even get my knife to cut it or my teeth to bite through it. 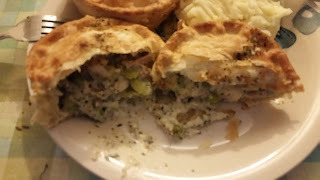 That aside, however, the pie was fine, with the cheese a nice addition and adding some flavour to the creamy potato and pea filling. I did email Pieminister about the crunch and it appears it was probably just an unusually tough bit of fennel, as other pie eaters haven't had a problem with it. But of course I can only rate based on what I ate! Overall I would say both pies were nice, but didn't quite blow me away like some Pieminister pies have recently. 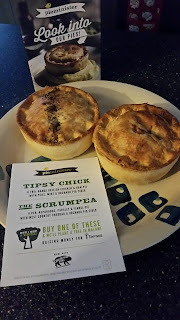 However I'm always pleased to see that Pieminister are not happy to just stick with what they have got, but regularly try out new pies and their pastry is some of the best around. Still worth buying!